The "I Ruff You" foam dog is an easy kids craft parents, grandparents and teachers will love to receive. The head, ears and paws are all heart-shaped with another big red heart right in the middle for your child to write a personal message. 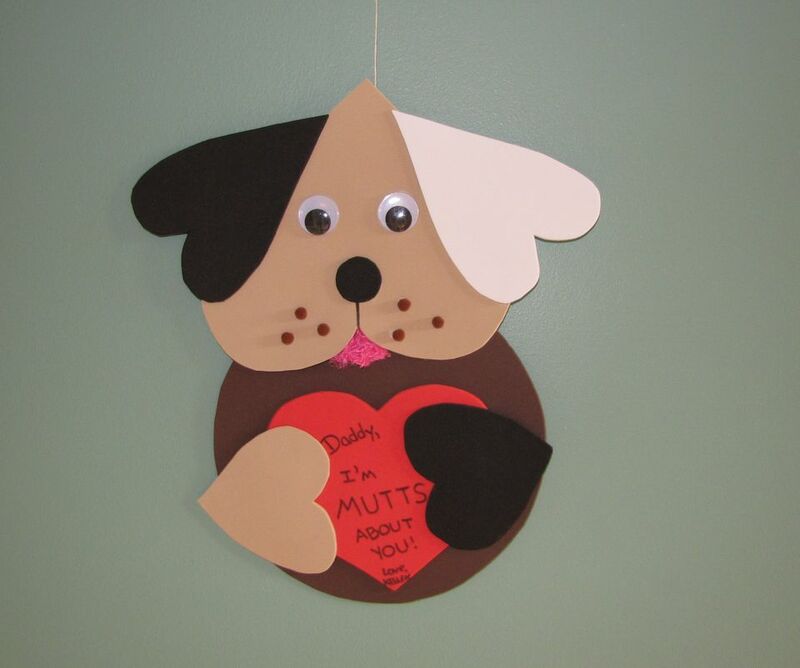 Say I Ruff You every day of the year by hanging it on your refrigerator. Children six and up who are allowed to use sharp scissors can complete this project without adult help. The shape of the foam can be difficult for younger children to cut with safety scissors. Once an adult cuts the shapes, all that's left is gluing so even preschoolers can have fun with this project. • A large circle on a brown foam sheet to make the dog's body. • A large heart on the beige foam sheet for the dog's face. • A medium-sized heart on a white foam sheet to create one ear. • Another medium-sized heart on a black foam sheet to make the other ear. • A small-sized heart on a beige foam sheet for one paw. • Another small-sized heart on a black foam sheet for the other paw. • A small circle for the nose on a black foam sheet. Sharp scissors work best to cut the foam. Don't worry about cutting directly on top of the pencil marks. This will be the backside of your dog and won't show. Turn the large beige heart upside down. The point of the heart will be the top of your dog's head. With a thin black marker, draw a straight line from the circle nose straight down toward the bottom of where the mouth will be. • Glue the top of the tongue to the backside of the head. Make sure the tongue sticks out enough to be seen. • Glue the dog's head to the round body. • Glue the red heart to the dog's body. Align the two paws over the red heart. Position them to leave enough room to create a message on the red heart. The paws can hang over the round body to give you more writing space. Glue a magnet to the back of the head to hang it on the refrigerator. You can also glue a string in a loop to the back of the dog's head (cross stitch floss works just as well). To make sure the string will hold, you can glue a small piece of foam scrap on top of the string. Since the head is glued on top of the body, the foam scrap also levels the two pieces so they hang better. Create a special message for your gift recipient and write it in black marker. This will get smudged if the foam gets wet. You can use foam letter stickers for a more permanent solution. Your total cost for this project will come in under $10. The supplies you need will give you enough materials to create more than one "I Ruff You" dog.